You might be used to seeing Holga 120 Medium-Format photos as being square. Yes, there is a default insert for the Holga which creates a square image on the film. But technically the film is continuous. It just runs and runs. You can put square images down onto it, and get 12 of them. But you can also put tall, thin rectangles onto it, and fit 16 of those. You do that by swapping out the insert. This is what the back interior of the Holga looks like normally. It’s just an open space. You then put in an insert to ensure that the light that hits the film is a clean-edged square. Or, as I mentioned, you can instead use the insert that is rectangular. 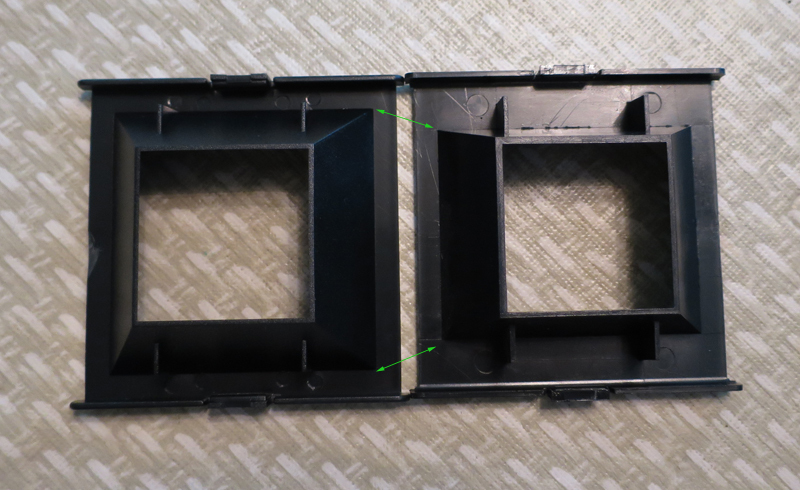 That way you use up the full amount of film from top to bottom, but from left to right you create a narrower image. That way you can stuff more of them onto a single roll of film. I’ve drawn green arrows here to see how they are slightly different from each other. It’s a small difference, but it gets you those four extra shots per roll. Of course, though, those shots are now thinner than normal. You’ve lost the edges of your square. Plus, your view-finder is still square. So you are looking through a square view-finder and trying to guess how much you’re going to lose off of both sides of what you see. I vastly prefer to shoot square :). Still, if you want to get 16 rectangular images on your film, this is how you do it. Just don’t forget that you also have to slide the film counter indicator on the back of your Holga, so that you go through the 1-2-3 counting of the 16 spaces, rather than counting off the 12 spaces. What happens if you mis-match the insert size with the counter pointer? Read here!